Decorating a small home poses some unique challenges that you wouldn’t face in big spaces. That you means you can’t do certain things, but it also provides room for creative decor. 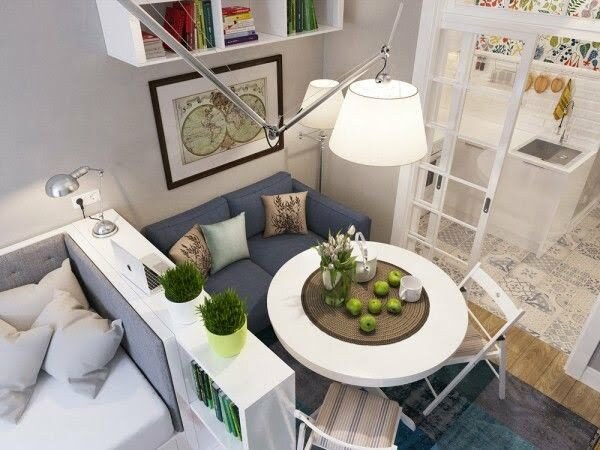 That’s why a lot of small space interior designs are so unique and lovely. So if you have small spaces to decorate, use it as a chance to get your creative juices really flowing. Here are some brilliant ideas to get you started. 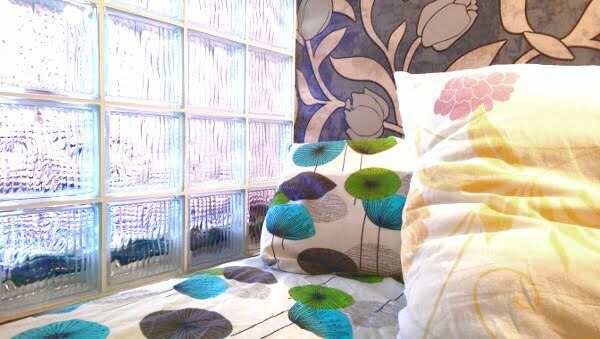 If your home has small windowless rooms, you can let natural light in by using semi-transparent materials (glass or acrylic) for wall fragments. 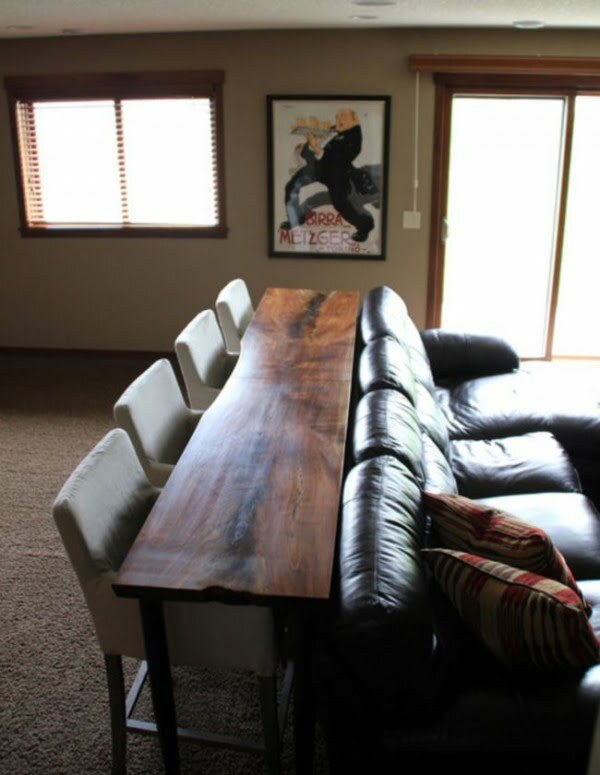 This obviously requires some planning, but you can use this idea for your next renovation project. So you have not enough room for a table and an extra shelf does nothing for the decor. 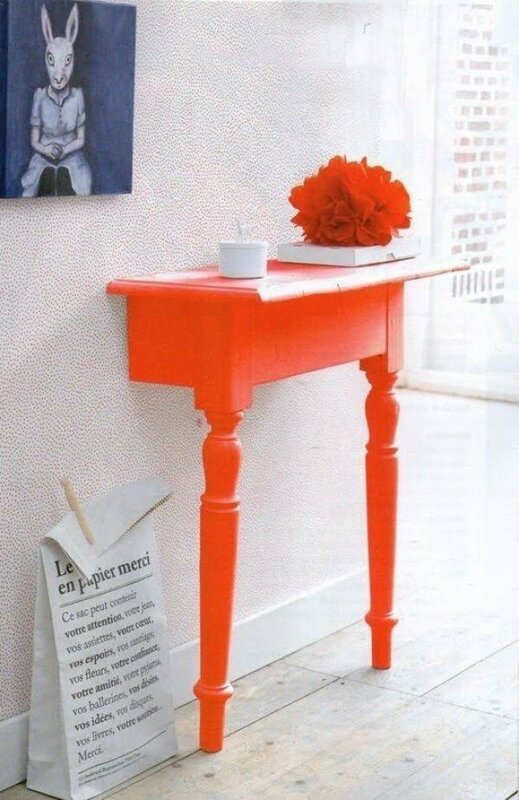 Cut an old table in half, paint it and install it against the wall. 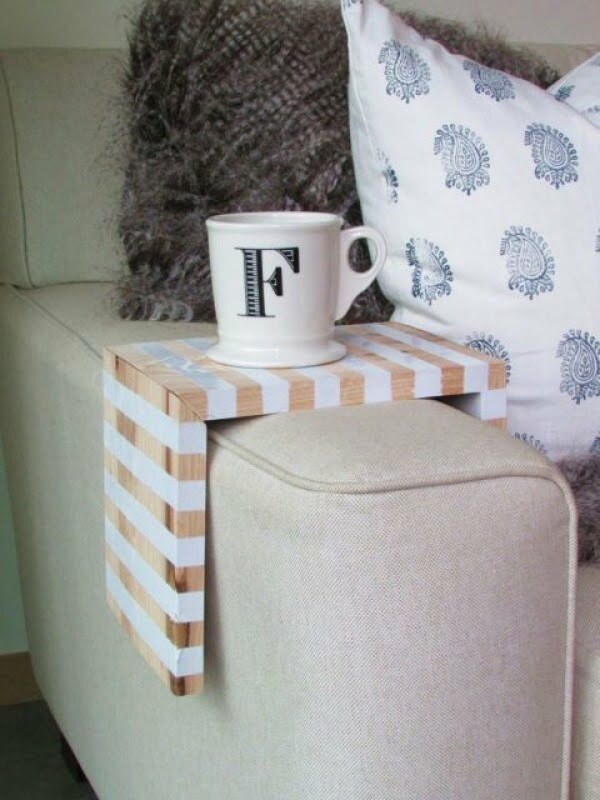 This crafty idea has all the visual benefits of a table and takes no more space than a shelf. 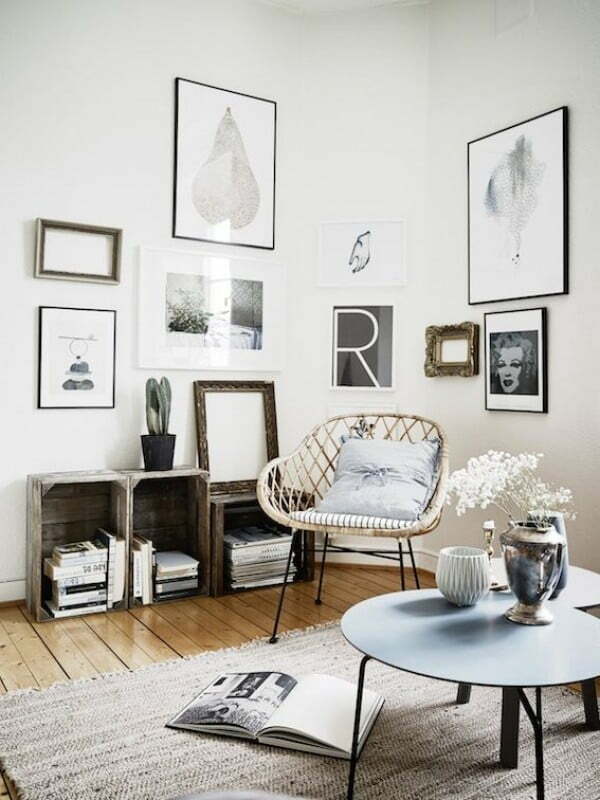 Decorate your shelf space with pictures and art pieces. You have little free wall space so be creative and don’t let the shelves claim all of it. 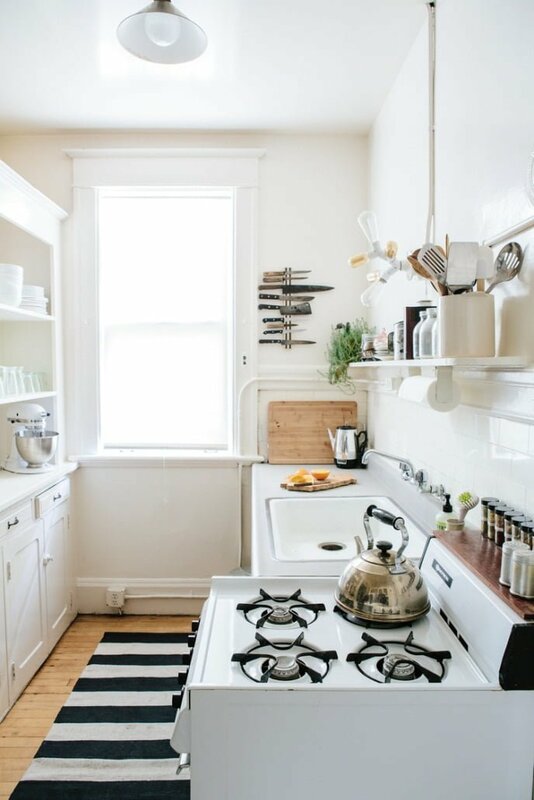 Small kitchens can be easily decorated with all the things you use in the kitchen. 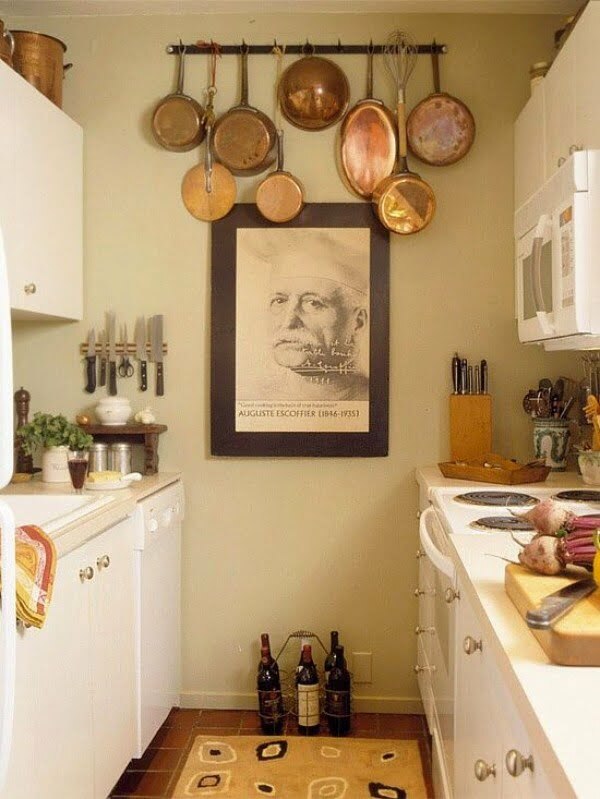 Pots and pans, dishes and other utensils can be hung on the walls or stacked in open shelves to create decorative kitchen vignettes. You may have little horizontal space but you still have plenty of vertical space. 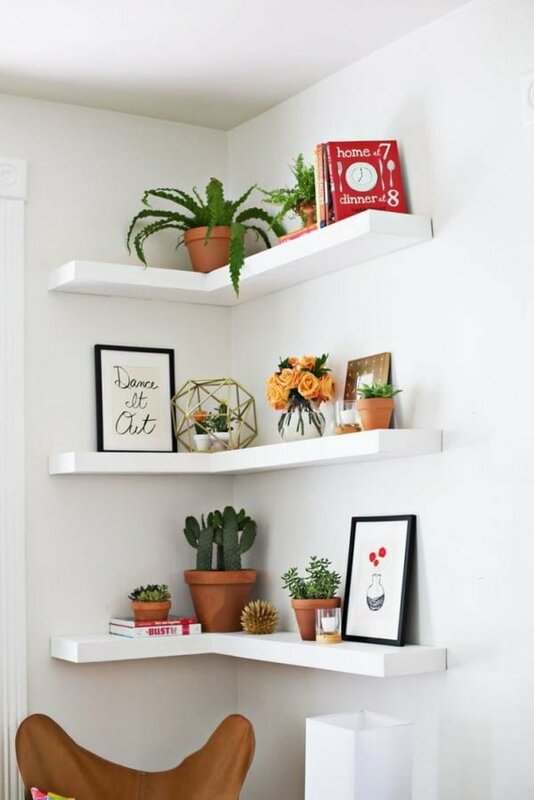 Add more wall shelves and decorate them with accessories, pictures and plants. DIY crafty little shelves are not only useful, they look cute too. 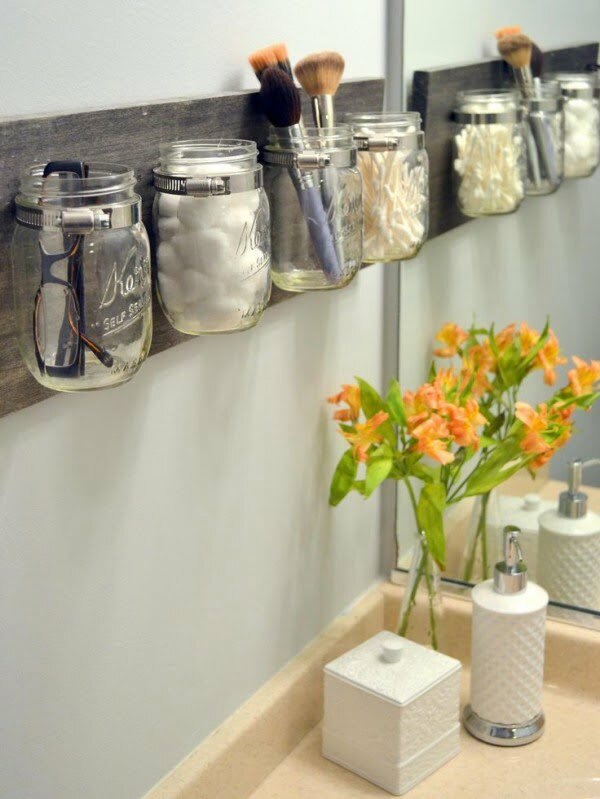 You can use old jars and some wood planks to create something wonderful like this. We usually have little empty wall estate for wall art in small homes so you have to use it wisely. 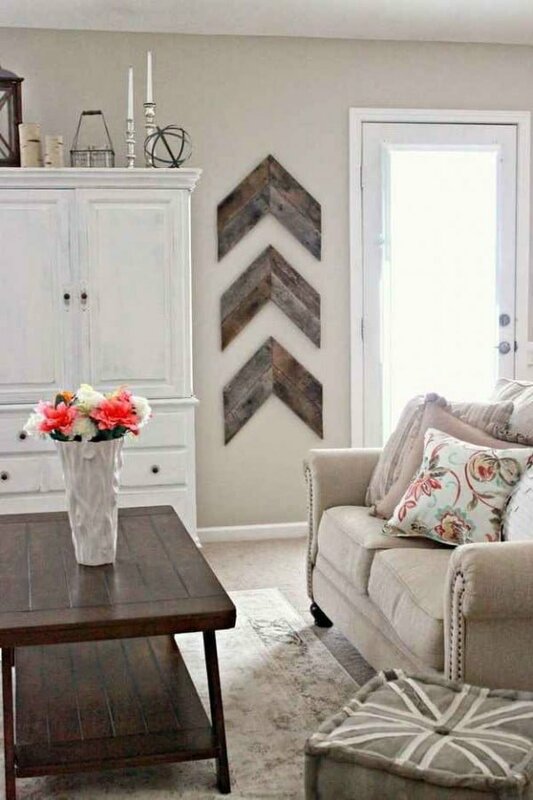 Find a small accent but one that makes a strong statement, such as these reclaimed wood decorative arrow boards. 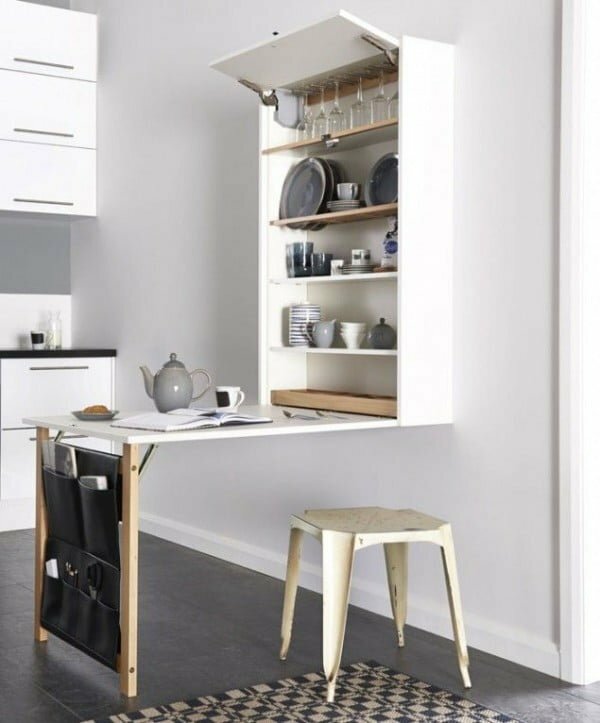 A shelf that opens up to make a table, a cabinet that turns into a kitchen bar, if you can get your hands on any kind of space saving multi-functional furniture use them in your small spaces. Hang big mirrors on the walls to make the space look bigger. 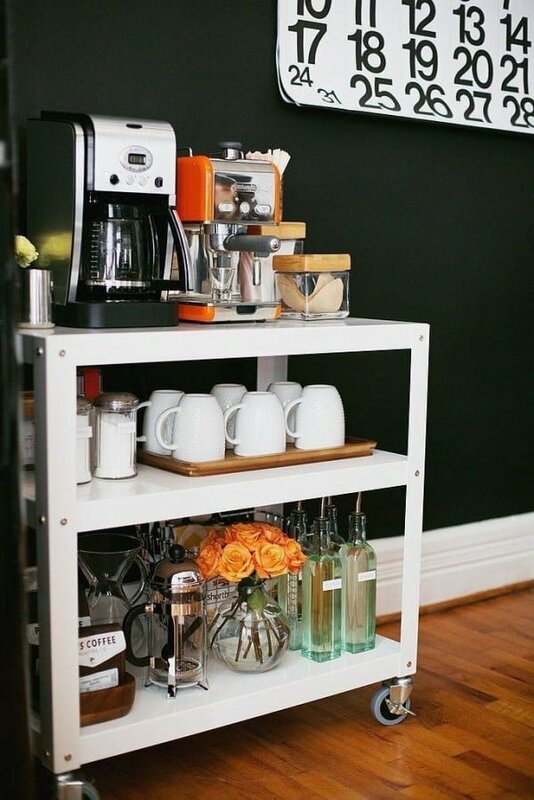 Carts, tables, bookshelves and other furniture on wheels can help you with saving space and you can place them in the positions where they block access but can be easily moved if necessary. You don’t need bulky furniture that takes up too much space in a small home. Get thin timeless furniture that looks classy and it will serve you in case you have to move. 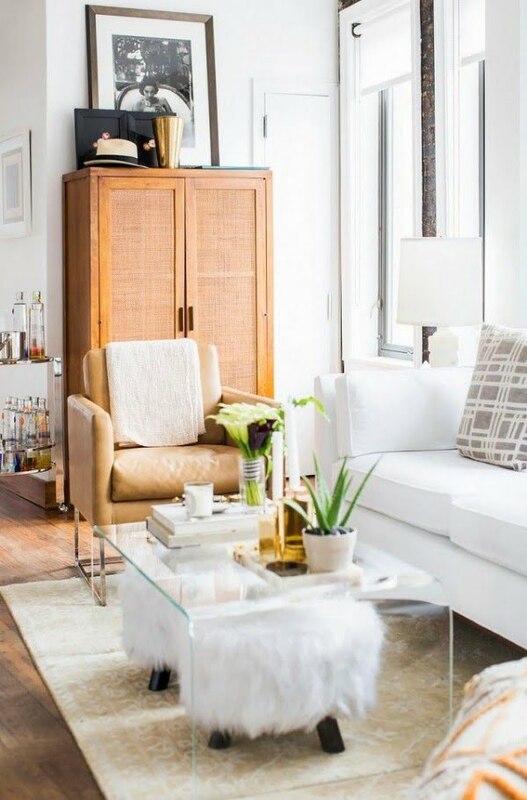 Transparent furniture is very neutral and doesn’t add the unnecessary weight to decor. 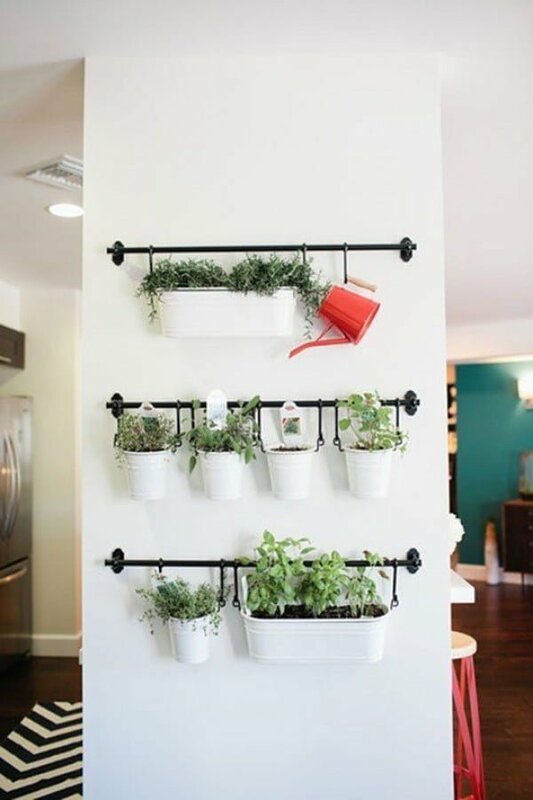 That’s very useful in small spaces and makes them look bigger. Pushing a long narrow table or a bookshelf against a couch gives you an extra surface or storage without taking up much space. Usually you have a lot of space around the door frames. Space that can be used not only for storage but for decorative purposes as you can put things on display and create beautiful doorway vignettes. We rarely partition small rooms but if you have to do it, use separating walls with bookshelves or tables to keep it functional and useful taking all that precious space. 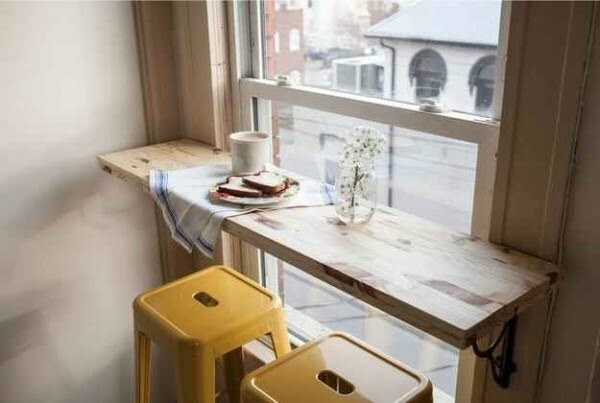 Window sills can be turned into benches, tables and nooks. And if your windows have no sills, you can still make use of that space by installing a DIY shelf against the window like this. 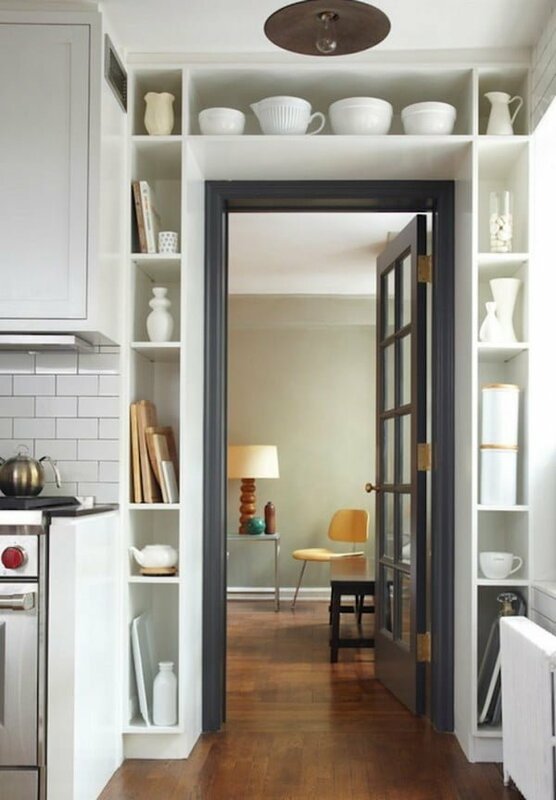 The more furniture with hidden storage you can get into your small house the better. You want to minimize the clutter to make the space look as big as possible. Built in wall cabinets and shelves make a great space saver and they always make an interesting interior design element. Some greenery is always a welcome accent in home decor but small spaces have a tendency to get cluttered quickly. To avoid that, you can install suspended pods on the wall and have an entire mini garden that is just brilliant and suits a small room very well. Finally, this little gem to end our list of ideas. 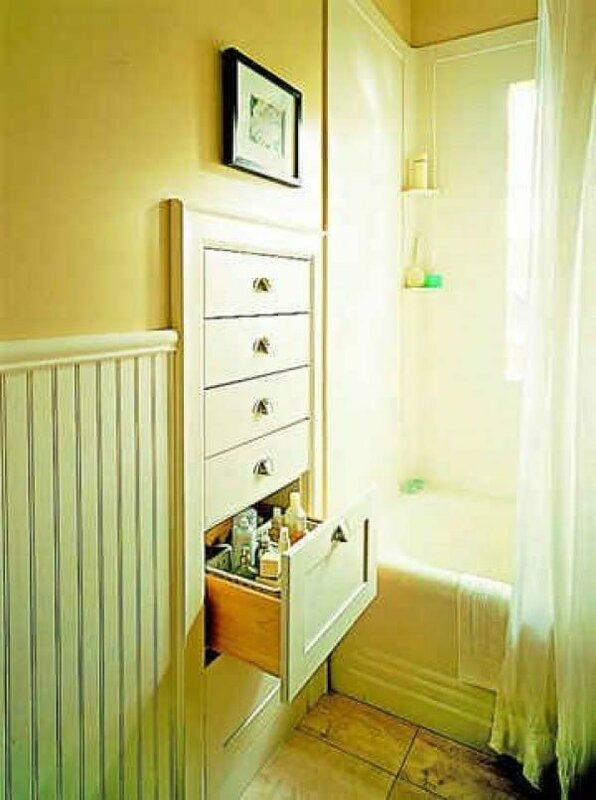 A simple but very useful DIY project for small spaces. If you can’t make room for a coffee table and not even an end table, this portable mini surface will serve as one for your cup of coffee. Having a blank canvas such as white walls not only gives you a clean, spacious feel, but also makes it easy for additions or regular edits. 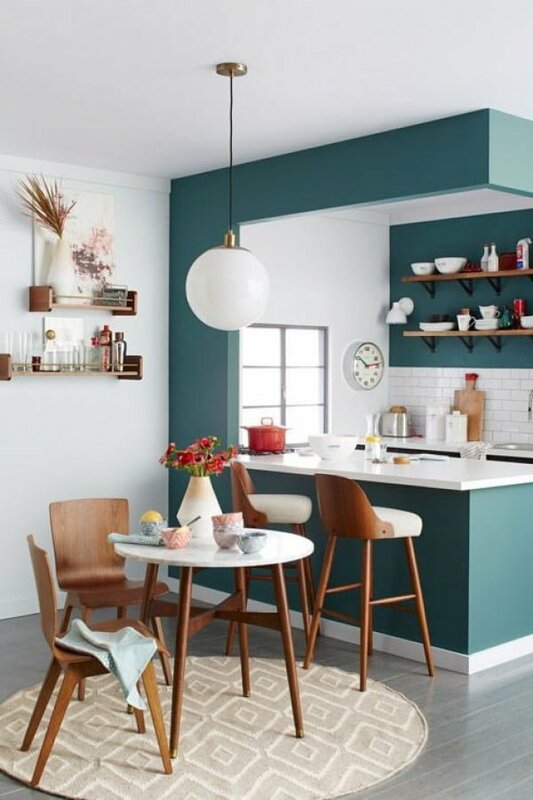 While a pop of bold color on the walls can be impactful, having to repaint it can be a burden. 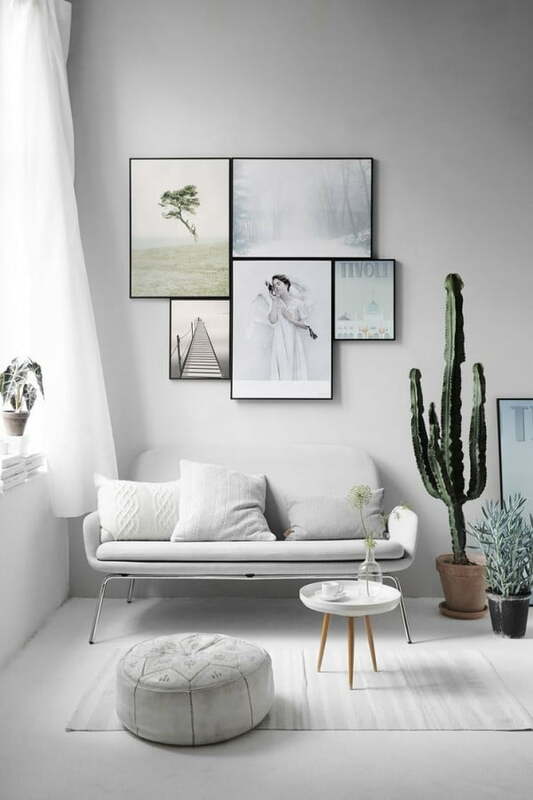 When you have a small space, the desire to change is more common, so stick to white walls for the ease of rearranging when the mood strikes. In the image above, the custom white sofa fits perfectly in a nook with white walls that serve as a canvas for contrasting pops of black. Change out artwork, accessories and more when it comes to accent colors. A general belief is that small spaces require small pieces of furniture. But this couldn’t be more wrong. In fact, focusing on a smaller number of large pieces that have multiple functions is a better investment in the long run than acquiring several small pieces that were meant to fit a specific way. So don’t be afraid to strategically fill a small room. When carried out the right way, a small space has the capacity to transform into a larger one as a result of furnishings and decor. 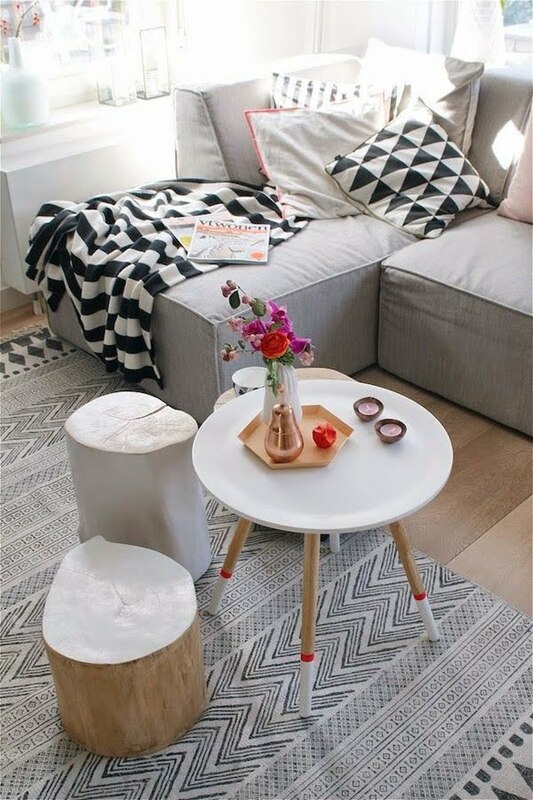 A large coffee table with hidden storage will become a focal point or a canopy bed can create the feel of another room in a studio apartment. 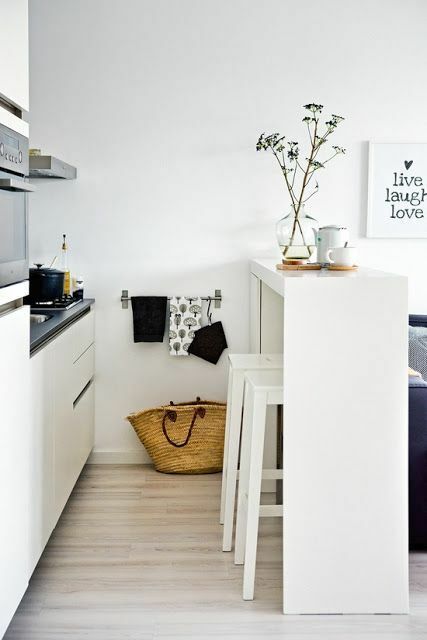 In the image above, a high counter serves as a key anchor point- it triples as a breakfast bar, extra storage space when cooking and as a separator between the kitchen and living room. If you aren’t lucky enough to have natural light, be sure to use multiple layers of lighting. Bringing in extra lightings such as sconces, table lamps or ceiling pendants will create extra brightness and you can also adjust these to match the desired ambiance of your space. In the most ideal situation, natural light would be abundant. If this is the case, we recommend lightweight, airy curtains that allow light to diffuse and wash through space. Consider the placement of mirrors to double the visual impact of a room. Strategically placing a mirror on a wall opposite from a window maximizes natural light and creates the feel of an extra window and an illusion of depth, and who doesn’t love a circular mirror! 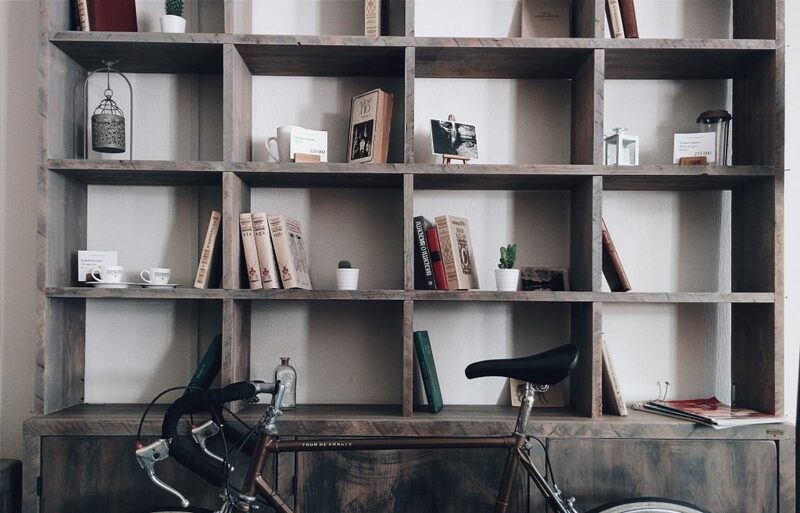 Consciously curate your space down to the small details. Select items that are not only visually appealing but are practical as well. 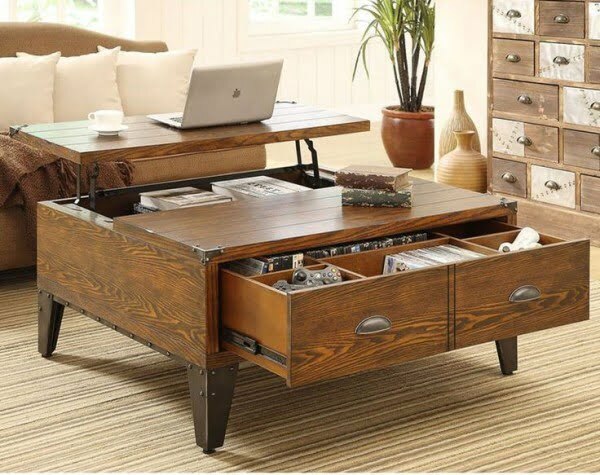 Choose furniture that accommodates items for storage AND display so that everything has a designated place. Plan the layout of a room to allow for easy movement. Establishing a focal point will give structure to the room. 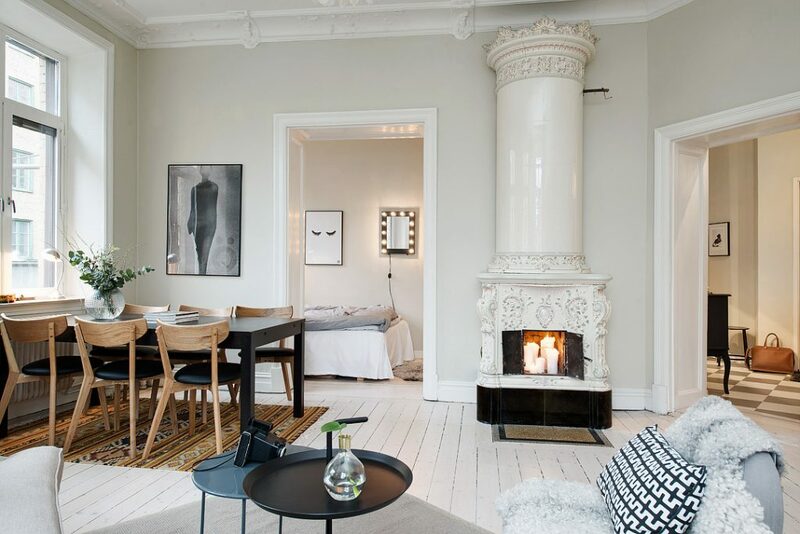 Fireplaces are a good place to start, creating a flow for the room with seating arranged around this point and allowing ease of movement. If you have low ceilings, choose a statement rug to draw attention to the floor. Rugs can define areas as separate spaces and create a natural order. 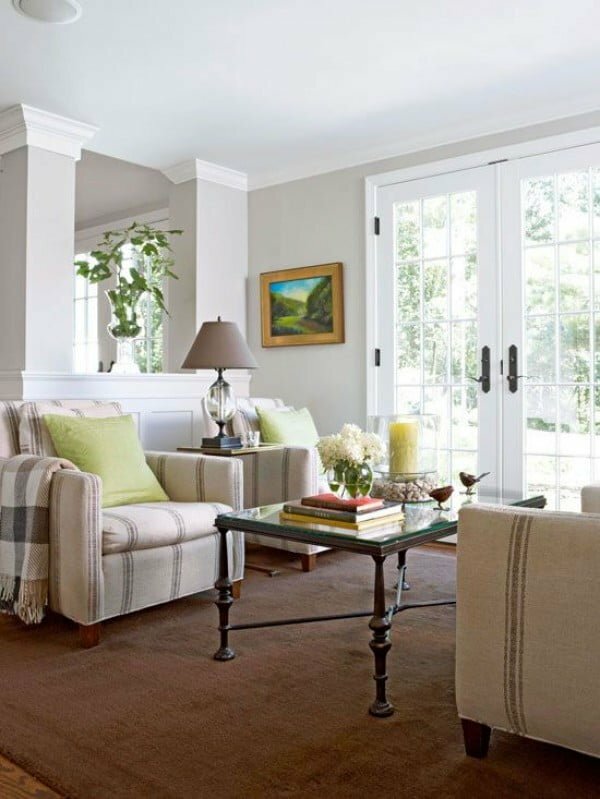 If you have a narrow space, choose a long runner rug with horizontal stripes to visually widen the space. 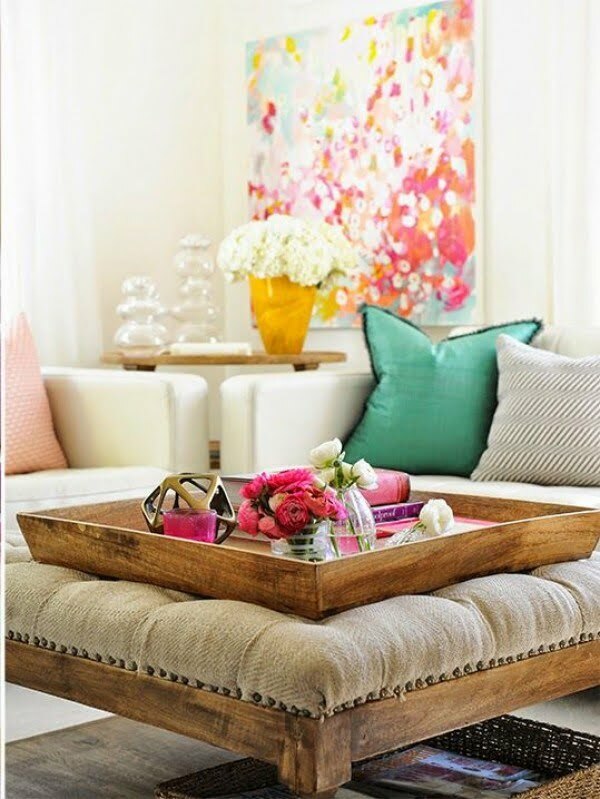 While the first thing to come to mind when accessorizing a room is to add a pop of color, when it comes to small spaces we opt for texture. Not only does it provide visual interest it also provides tactile interest. Bring dimension to the room and give it a personality by balancing aged woods, metals, patterned textiles, etc. 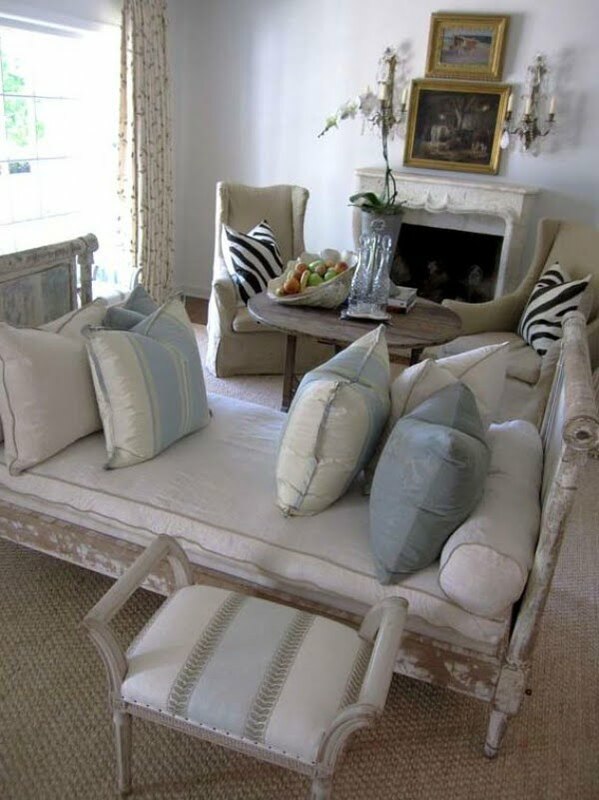 We love incorporating natural elements such as rocks, shells or driftwood or organic linens and knits. It’s no secret we love our greenery. 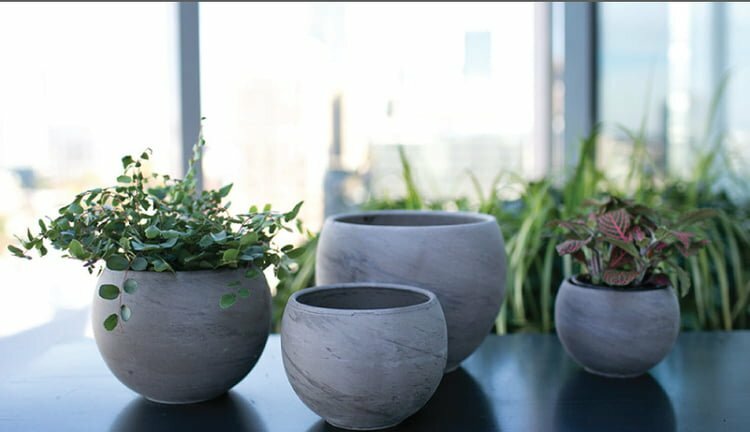 Everything from the calming color of green to the simplicity of succulents, plants, whether faux or real, just add more life to a space. Hello fiddle leaf fig tree! There’s a reason it’s on every design blog and just so happens to be one of our bestsellers. In the image above, storage areas are broken up with greenery to turn them into visually pleasing vignettes. Clear the shelves and surround yourself with essentials you love and have personal meaning. It feels great to shed yourself of excess clutter and makes living in a small space more comfortable. Not only will it leave you with possessions that have a truly sentimental story but it will also leave you with a calm mind. 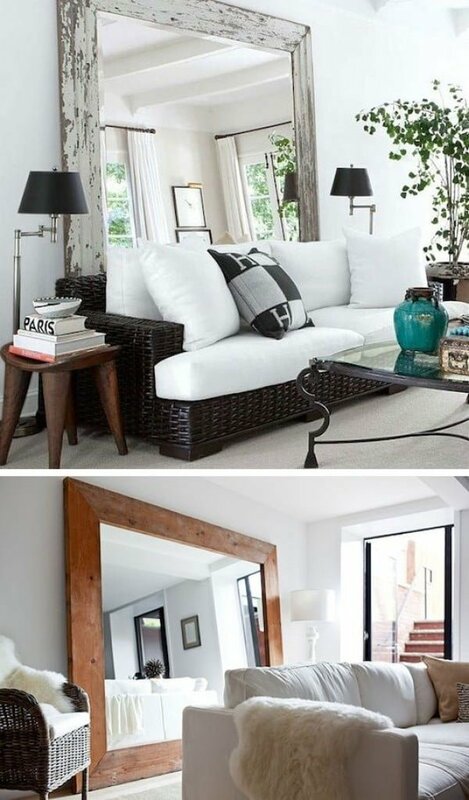 Consider passing along your item to someone else who could put it to better use- you might despise that mirror in the foyer but love it in your neighbor’s bedroom. After you minimize your belongings, you will be able to use otherwise obvious places for new spaces. Consider turning a closet or otherwise unusable architectural element into a workspace nook. You’re just a few layout tweaks away from making your small living room look much bigger. While you can’t physically extend the space (short of taking down the walls), you can do it visually and it is all about how it feels being in the room more than anything. 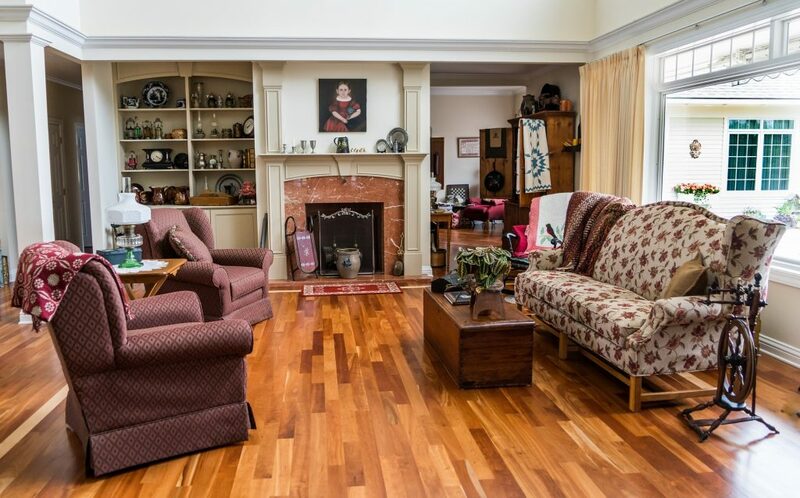 Indeed, a badly decorated bigger room may seem smaller than a well decorated smaller room would. First of all, always keep in mind that you’re working with a limited space and not every decor idea that applies to big rooms can be applied here. 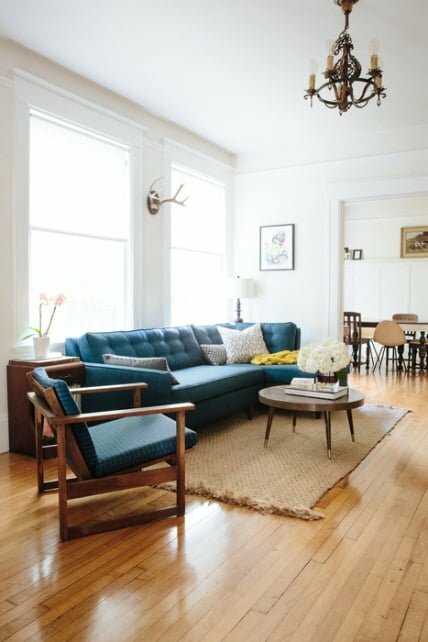 It’s better to keep fewer furniture than to clutter the space up, even if it means you’ll only have a sofa with a coffee table and a single chair to make up the entire layout. Use a tiny rug and you make your room look much smaller than it is because it divides the space visually. A big rug on the other hand anchors the room well and even makes the room look bigger. This may seem counter-intuitive but pushing every piece of furniture against the walls trying to save space only makes it look like a warehouse and is one of the most common mistakes in home decor. 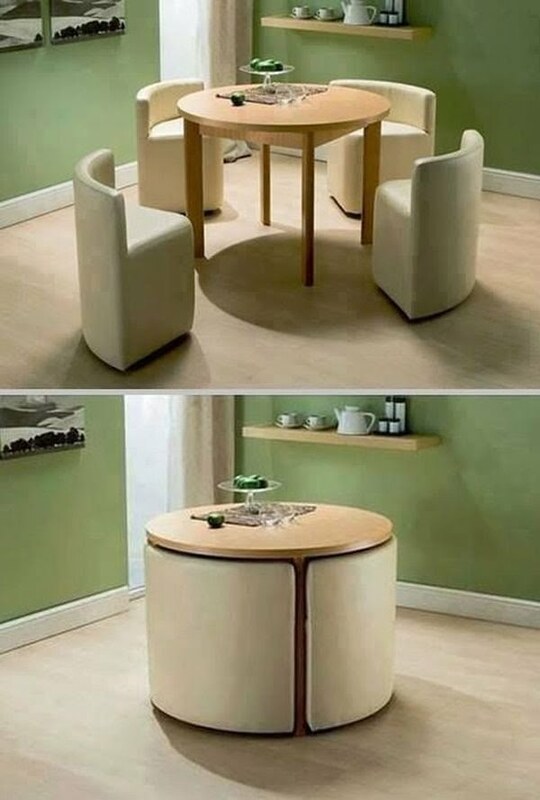 There are better ways to arrange the furniture to open up the space. 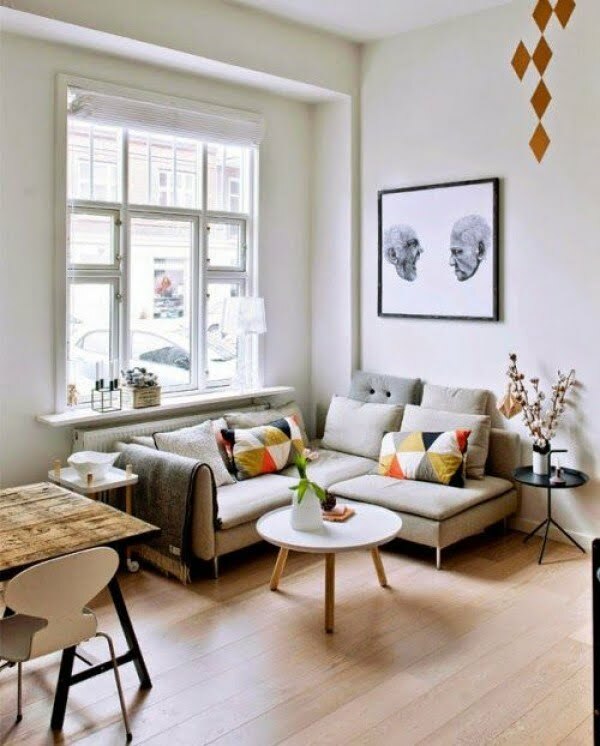 While you should keep the big sofa pushed against the wall, the middle of the room should be occupied by smaller and thinner furniture that doesn’t occupy much space. Decorating the corners is ever so important in a small room. First of all, it gives you the extra space, but more importantly softening the edges gives the feeling of a bigger space. 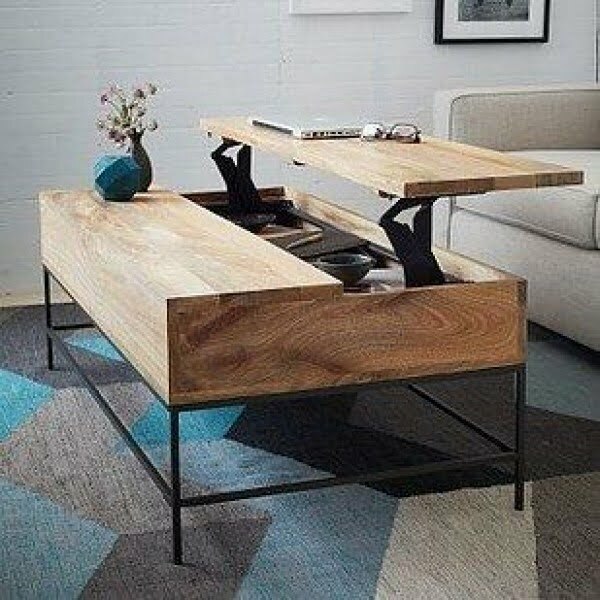 Remove clutter by storing things in furniture with hidden storage like this coffee table. 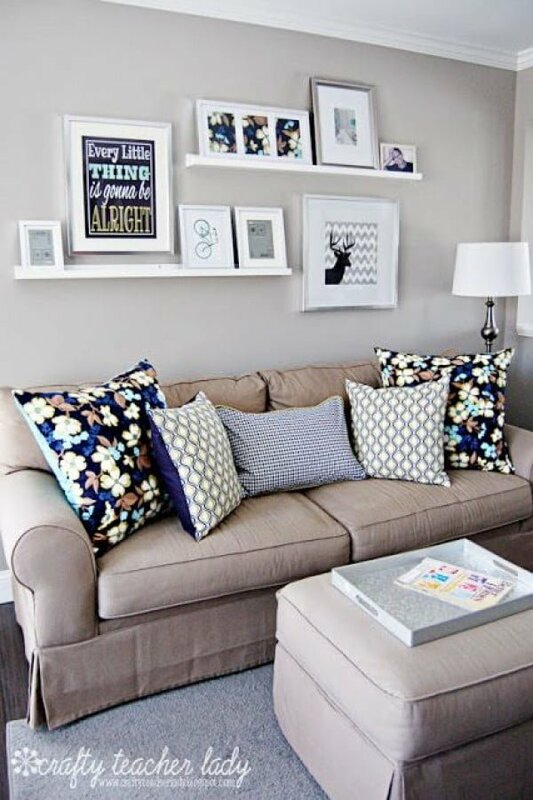 A great storage tweak for a small room is pushing a bookcase against a sofa, this does not only give you extra storage space but an extra surface too. Just remember to use a smaller sofa if you place it in the middle of the room. A backless sofa is a less common piece of furniture but it actually allows you to create a more versatile layout open from different angles. A small room doesn’t really have a lot of space to keep a lot of chairs around for guests. A good option is putting the chairs away and taking them out only when necessary. Get smaller chairs that you can put away in the closet or under the bed. An open plan kitchen is great for a small apartment and you should take advantage of it by not dividing the room visually. 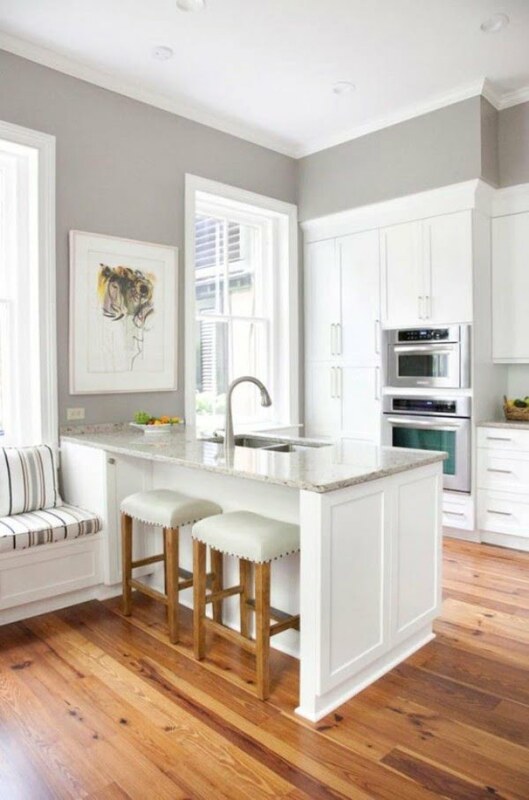 Keep the same floor finish, match the kitchen cabinet and wall colors to leave the space unified and visually bigger. 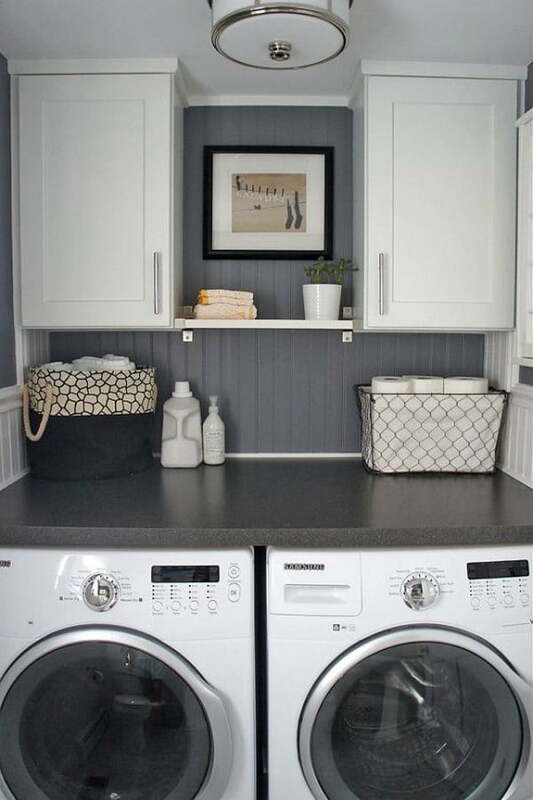 What are some of your favorite ways to maximize a small space?